Once you've created a data source, it is stored in your list of data sources. You may want to go back to that data source to see how you set it up, or to make a change. 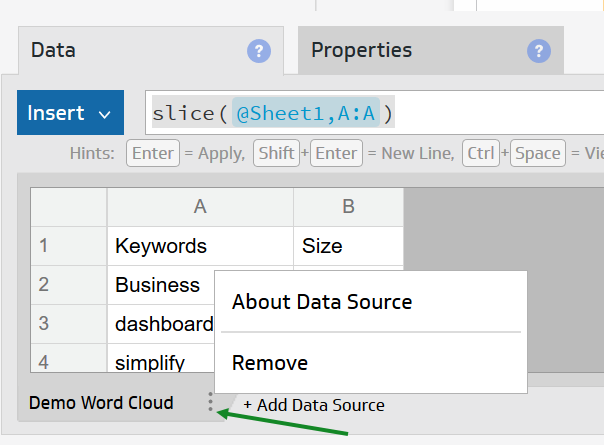 To edit your data source, simply find the one you want to edit in your list of data sources and reconfigure it. Note: Some data sources do not have the reconfigure option. In the left navigation bar, click Data Sources. From the list of data sources, choose the one you want to edit. On the About this Data Source page, select Reconfigure Connection. If prompted, authenticate or choose a token for the account you want to work with. You are now on the Edit Data Source page, where you can make changes.